Prague has recently become one of the most visited cities in Europe— and for good reason. 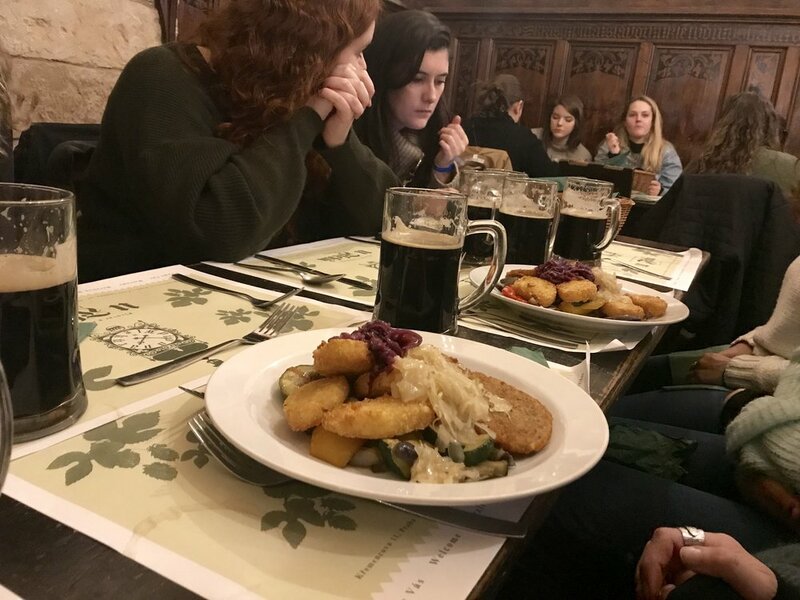 Not only is it home to the largest (and arguably coldest) medieval castle in the world, endless craft beer options and remarkable, Parisian-esque architecture, this Czech capitol boasts both a stirring Nationalism and falafel like you’ve never tasted before. 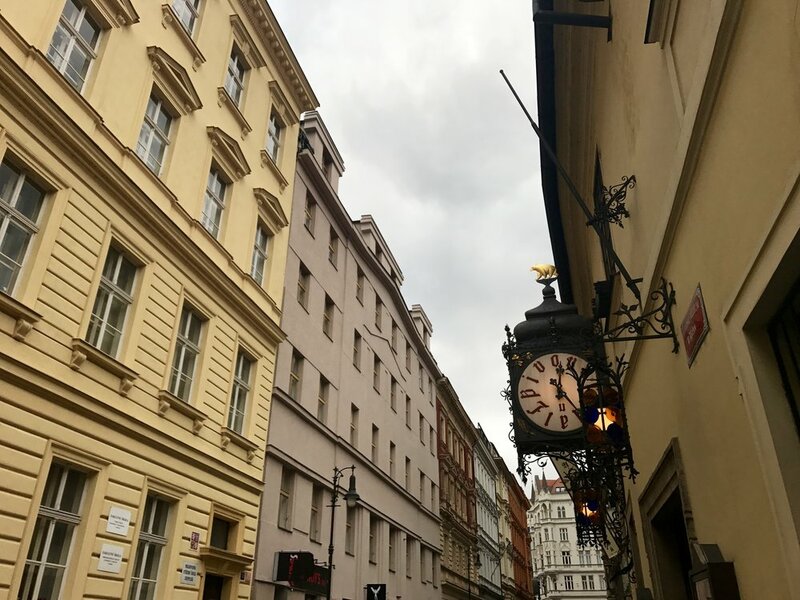 Prague’s public transportation, ranked fifth in the world, had us zipping from (as the New York Times so kindly puts it) the ‘party-friendly neighborhoods’ of Vinohrady and Zizkov to the more traditionally tourist Mala Strana district and Old Town Center to the ever incredible Kampa Island. It was a fairytale weekend in every way and I’ve put together a list my top hits and tragic misses. Or, as I like to think of them, just a few more reasons to return. We stayed with a large group of students at The Czech Inn; a popular ‘luxury’ hostel about 15 minutes from the center via public transportation. At only 8 Euro a night, the bunk rooms were clean, safe, and exactly what we needed. The towels were free, the staff friendly and the water pressure ideal. You can even change Euros at the front desk without getting ripped off, which is a plus. Most importantly, the complimentary breakfast buffet was unparalleled. Warm rolls, platters of fresh veggies and fruit and hot coffee were my go to all three mornings we stayed there. 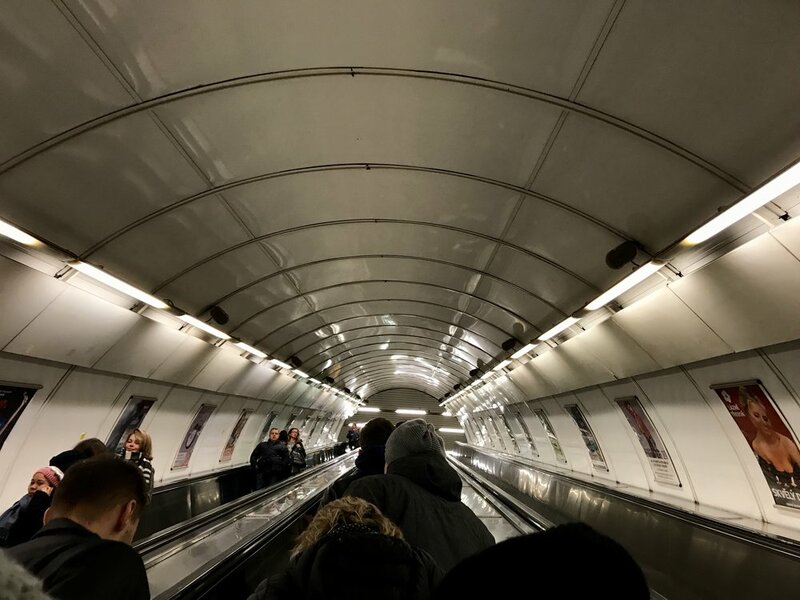 An unlimited 24-hour public transportation pass ran about 100 CZK (or 4 Euros) a day and is totally the way to go. We bought them from the front desk of our hostel but you can get them at any underground station in the city and most corner stores. Pro tip: if you are feeling a little walking-tour weary and don’t feel like battling freezing rain and bus schedules on your way home, Ubers are everywhere and run about 3(!) US dollars for a 10-minute ride. Not bad. At this point I humbly consider myself a walking tour pro. We’ve participated in free tours, school tours, private tours and my favorite (though slightly frowned upon) ‘tag-along-tours’. 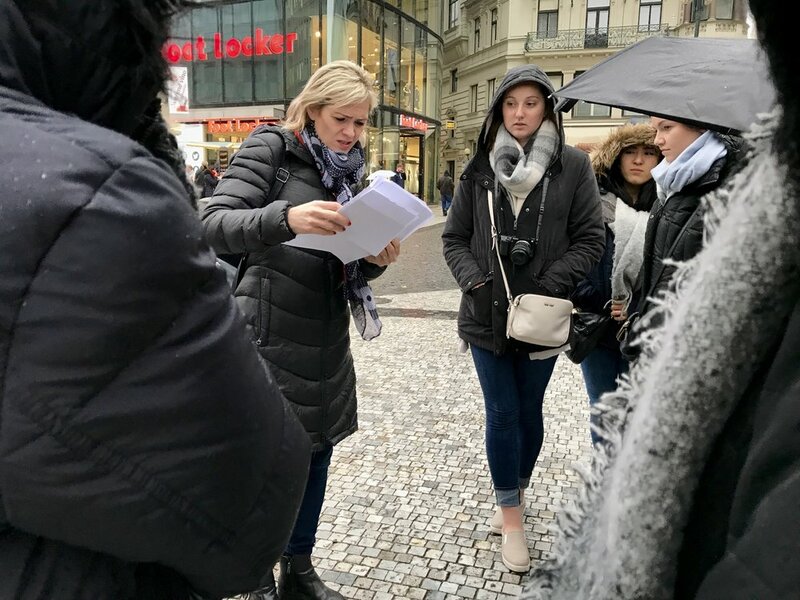 None, however, have lived up to the level of our three hour New Prague Walking Tour that first morning in the Czech Republic. Our guide, a Czechoslovakian Cameron Diaz look-alike named Andrea did more than show us the ropes. She took us to the famous Wenceslas Square in New Town, through Old Town Center, the Jewish Quarter and the always-beautiful Rudolfinum. We felt especially lucky because we happened to be touring on the 17th of November- the 28th anniversary of the Velvet Revolution. Hopelessly ignorant to the political intricacies of the Czech Republic, I soaked up Andrea's every word. Although only 13 years old at the time of the revolution, Andrea explained the student protests that led to a peaceful conversion to a Parliamentary Republic, the eventual split of Slovakia and the Czech Republic, and the modern repercussions of Communism on the two nations beautifully, leaving the whole group misty eyed. (Disclaimer: that could have been just me. Either way.) For more (and significantly more reliable) information on the Velvet Revolution, I recommend checking out BBC’s super understandable summary and Michelle Jana Chan's incredible fist person account. Although I didn’t have time to explore the Franz Kafka museum, it’s supposed to be one of Prague’s highlights. My personal recommendation is to skip the literary exhibition (sorry!) and hit the pink gingerbread cafe across from the museum instead. Filled to the brim with traditional hand made Czech desserts, hot cider and chocolate truffles, I personally opted for a coconut covered gingerbread ball; a delicious and adorable decision. 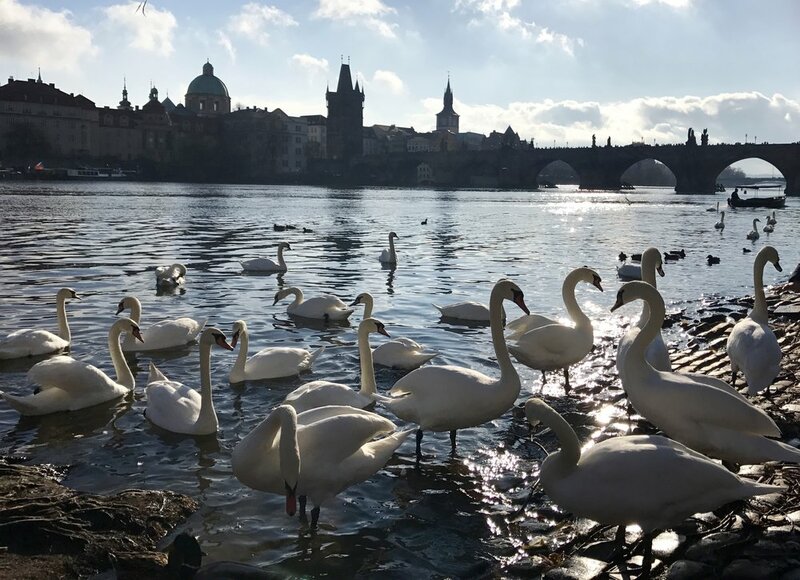 You might as well make a pit stop to the park underneath the Charles Bridge and make some feathered friends. It is equal parts creepy and exhilarating. I reccommend stealing free breakfast bread from your hostel as a peace offering. Two of the most famous tourist attractions in Prague, these two amazing structures are totally walkable. The Bridge, Constructed in the early 15th century, has withstood incredible trials and- two World Wars and 600 years later- remains beautifully intact. The John Lennon Wall, though it’s history is much more recent, is equally emotional. After his death in 1980, John Lennon became a heroic symbol to the pacifist youth of Central and Eastern Europe during the totalitarian era. As a form of protest against the regime a group of students painted his face and lyrics on this very wall every night, despite potential jail time, a strict curfew, and, eventually guards stationed at the wall to discourage graffiti. At first glance, the Lennon wall might look just like any other graffiti-covered wall- but if you look closely it is still filled with messages of peace and hope. Often referred to as Prague’s equivalent to the Berlin wall and an inspiration to the Velvet Revolution, the Lennon Wall isn’t just a photoshoot opportunity or tourist trap- it’s a visual representation of global democracy. The Prague Castle, the largest in the world is most memorably… cold. It seems that our first walking tour in Prague was so amazing that our last one decided to lie down and give up. Although breathtaking from every angle and full of interesting history, the Prague Castle is best enjoyed from the inside. The highlight was absolutely St. Vitus Cathedral. Completed over the course of 200 years, the St. Vitus boasts dramatically different architectural styles and a diverse array of materials. Conclusions; absolutely hike up to the castle for the view, but be sure to get it in before dark (or, even better, before October) or you will be at severe risk of impulse-purchasing I <3 Prague mittens to save your fingers. You have been warned. I amazing have highlights… and I just a few regrets. Overall, this has been my favorite weekend of eating yet. Four Euros, five falafel patties, unlimited veggies and open until 5am? Sold before I even tasted it. After? I’m officially ready to plan another trip. I was a little dubious about the dinner options in a city famous for it’s meat sauce, but Maitrea dispelled any and all fears. Don’t be any more worried about traveling to Prague as a vegetarian as you do an indoor mall in Ohio. You’ll be more fine. I currently opted for sweet eggplant curry and rice with a Sundried Tomato and tempe Bruschetta appetizer. My total came to a whopping 8 euro and I actually teared up at the apps. 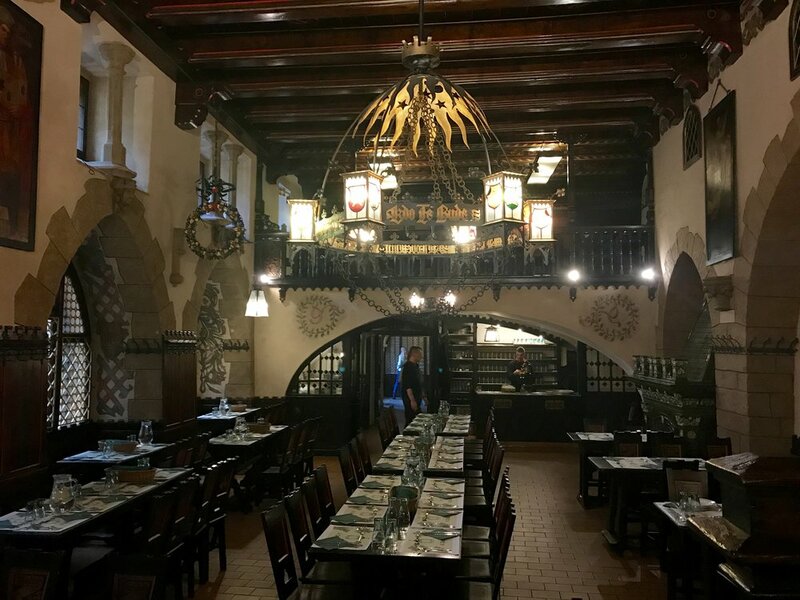 Nestled in the back streets of Old Town, Maitrea is a must-hit for vegetarians (and honestly, everyone) in Prague. Opting for the organized lunch our second day, U Fluku was one of my favorite meals. For about ten Euro we were served a pint of beer about as black (and tasty, no offense) as tar, a bowl of the best potato soup I’ve ever had, a basket of warm rye bread, a totally vegan entree of sauerkraut, potato and fried eggplant (they had goulash and other meat options as well), and APPLE STRUDEL. Served in a beer hall resembling a pub from Beauty and the Beast, I would like to have this for lunch every day for the rest of my life, thank you. The street food in Prague is unlike anywhere in the world. My favorite, of course, is the Trdelnik. Imagine a Panera Cinnamon Crunch Bagel, flattened out, warm from the oven and in the shape of a little chimney. You can get them filled with cream, Nutella, fruit or a mixture of the three. I prefer them hollow, smooth and scalding hot. And yes, the sparkles you can see on my chin in the picture below is absolutely cinnamon sugar. The first night in Prague we headed to U Sudu, a quick tram ride from our hostel, this underground bar is made up of four vaulted, interconnected basements and an upstairs wine bar. From the outside it looks like a basic, one-room pub and the interior feels like a hipster haunted house filled with foosball tables and a dance floor. It’s a real mix of locals and tourists, which suited us perfectly. The second evening out in Prague led us to a petite little- you guessed it- underground bar. Despite it’s name, the Sad Man’s Tongue is charming, filled with cozy booths and strange wall prints. A man with a mustache and an acoustic guitar played John Mayer and Rhianna covers on a raised platform in the corner. I don’t know if 36 hours is quite enough time to determine this, but I really felt like I was in Prague.